Barry, a ridiculously rich hedge fund manager, loses it and strikes out on a cross-country bus trip. However this is no journey of self discovery due to other people and experiences. It’s all about Barry all the time. 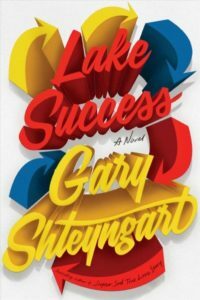 There’s a lot to be interested in within this satiric novel but it’s not a comfortable read. When you measure your actual value by your financial net worth you’re deluding yourself, and Barry is one of the most self-deluded characters to ever inhabit a novel. He lives in a fantasy world only partly made possible by unimaginable wealth. Both his daydreams and interactions with other people are also completely narcissistic and off-kilter. The man doesn’t have a clue but imagines he knows the solution, only to decide that solution is something else entirely when he hits the next bus stop. Barry’s wife, Seema, has a modicum of self-awareness with a degree of loathing for her husband’s business and how hedge funds have ruined the lives of many Americans. Her focus centers on their young son, recently diagnosed with severe autism, but she also struggles with her own identity. The 2016 election frames both Barry’s bus trip and Seema’s life in Manhattan. Candidate Trump’s crudities and narcism are paralleled by the novel’s two main characters but also reflected in encounters across the country. Ultimately this is a book about white male privilege and its inherent advantages, right through to the unsatisfying ending reflects. There are a few pages at the very end that brighten the outlook (for Barry at least), but the rest of the book reflects today’s America too much for comfort. It’s a satire that stings. While The Great Gatsby is referenced often, Bonfire of the Vanities is the more appropriate comparison. And Tom Wolfe did a better job. After a disastrous dinner party Barry tries to force his silent, autistic son to speak. When his wife and nanny intervene he grabs some of his favorite watches (there’s a lot about watches in this book) and heads for the Greyhound station intending to find his college sweetheart. To evade his efficient chief-of-staff he dumps his created cards and cell phone. And, off he goes. For more about the author and this book click here. 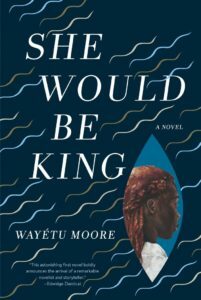 This exceptional debut novel crafts a creation mythology for the country of Liberia that puts Rome’s Romulus and Remus in the shade. Some might call it magical realism, but it’s far more than that. This intense book follows four characters who suffer great loss and pain — either as slaves or as a victim of harsh superstition in a West African village. Yet these four all also each have a supernatural power — a power that relates directly to their suffering. The focus is Liberia, once called Monrovia, a settlement on Africa’s west coast founded by abolitionists and others for slaves and free blacks. Moore’s reimagined origin story for this country not only reveals the flaws in the original settler’s idealism, it also showcases the exceptional strengths needed for an independent African nation to survive in the late 19th century: hidden power, continual rebirth, extreme resilience. Moore’s tale portrays the coming together of resettled African Americans and the area’s indigenous tribes in a way that was sadly lacking in actual history. If only her version were true. It’s certainly an exceptional read. Gbessa, born on a cursed day, is spurned by her tribe and marked for death. June Dey, born of a spirit, is a slave of suspicious origin. Jamaican Maroon Norman, born of a white researcher and black slave, finds himself the subject of prejudiced research. All need each other, as well as their spirit mother, to bring Liberia into it’s ideal existence.